What’s up with this crazy idea that narcissism and Aspergers are the same thing? 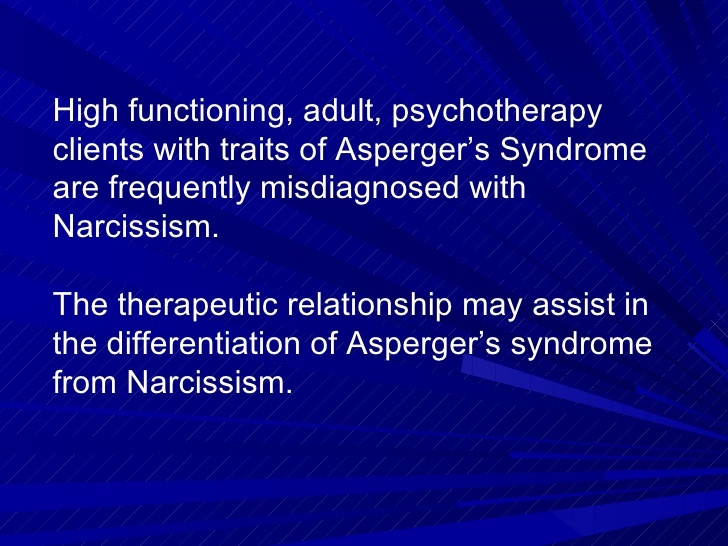 As a person with Aspergers who has been a victim of narcissists all my life, the difference seems pretty clear to me, but to some people, including mental health professionals, high-functioning autism (Aspergers) and narcissism are seen as the same disorder! A thread on Wrong Planet, a forum for people with autism and Aspergers (a high functioning form of autism) discusses the confusion, with people on both sides of the Aspergers=Narcissism fence. Cited there is an article from Psychology Today, which quotes Sam Vaknin who believes narcissism is an autism spectrum disorder! The British psychiatrist Dr. Khalid A. Mansour concurs. Clearly, some people don’t understand much about high functioning autism/Aspergers. Yes, I believe it’s possible for a person to be both a narcissist AND on the autism spectrum (an example might be Mark Zuckerberg, creator of Facebook, especially as he was portrayed in the movie “The Social Network“), but they are two vastly different disorders. Appearances are only skin deep. I understand where the confusion comes from. On the surface, the two disorders can appear similar. People on the autism spectrum may seem as if they lack empathy because they do not express their emotions well, which of course includes showing empathy. They also sometimes blurt out inappropriate or hurtful things, not because they mean to, but because they honestly don’t know any better: they have great difficulty reading social cues. They can appear selfish and sometimes get angry or upset when their routines are interrupted or they are forced to pull themselves away from their solitary pursuits to engage with others. They can also violate the boundaries of others. All of these surface behaviors may look a lot like narcissism. But appearances are only skin deep, and this is where any similarity ends. Lack of empathy seems to be the most commonly mentioned “characteristic” of both Aspies and narcissists. 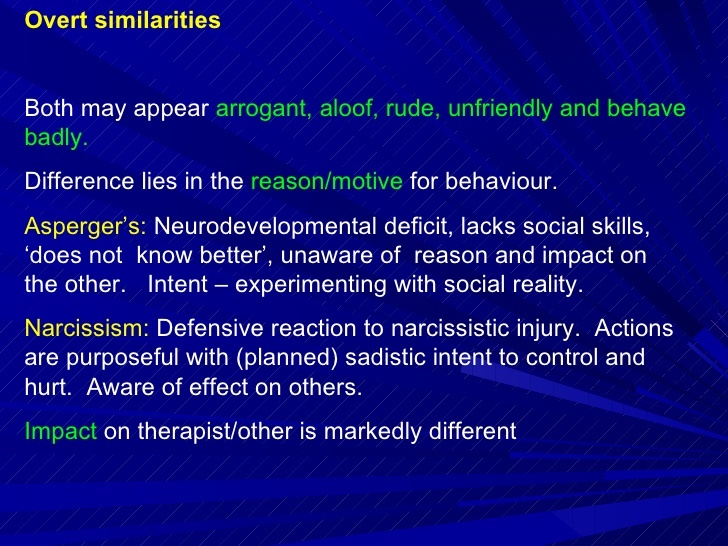 But in actuality, as far as empathy is concerned, a person with autism/Aspergers is the polar opposite of a narcissist. A narcissist cannot feel empathy, but can act as if they do. They are good actors and can fake emotion they do not feel. They can lie well; Aspies cannot lie or lie very badly. People with Aspergers and high functioning autism are great at picking up the emotions of others around them and are even sometimes overwhelmed by other people’s emotions (which sometimes makes them withdraw and that can make them seem like they lack empathy). They can be bad at expressing empathy because of their inability to read social cues or know what to say and do. Therefore, Aspies can feel empathy but often act as if they do not. Narcissists can say hurtful or damaging things because (a) they don’t care how you feel; or (b) because they want to hurt you. People with autism/Aspergers say hurtful things too sometimes, but it’s never intentional and they do care how you feel. If they are told they said something hurtful, most autists/Aspies are consumed with guilt and will sincerely apologize. They blurt things out because they sometimes do not know it’s not appropriate to do so. Aspies and autists hate to have their comforting routines interrupted because repetition is something that grounds and relaxes them. A low functioning person with autism will sometimes perform repetitive movements or repeat a phrase over and over. This is how they cope with too much stimuli coming in. If they are interrupted, a low-functioning autist may fly into a rage or have a temper tantrum. Disengaging and switching gears is impossible for them. At the higher end of the spectrum, an Aspie or high functioning autist may not repeat the same word or action over and over, but they have their hobbies and obsessions which they pursue with a single-minded intensity. They tend to hyper-focus on whatever interests them. If they are interrupted from whatever their mind is focused on, they may snap at you or become very annoyed. They can switch gears if they must but they hate doing it. A narcissist may also snap or become annoyed, but not because they have difficulty switching gears but because they are just plain selfish and don’t want to do something that might please someone else besides themselves. Think of the narcissistic husband playing a video game. His wife comes into the room and asks for some help opening a stuck window. The husband flies into a rage and tells her he’s busy and to do it herself. It’s not because he’s that engrossed in the game or even cares about it that much, it’s because he doesn’t want to put himself out for his wife. For an Aspie or autist, the game engages all of their senses and their mind is extremely focused. They simply can’t pull away from it. A person with autism or Aspergers can and do violate the boundaries of others. Again, this is because they can’t read social cues well enough to know when they are violating someone else’s boundaries. A narcissist knows full well when they are violating boundaries, but they simply do not care. To me it’s as absurd as comparing the small narcissistic child recklessly driving a car, to a person trying to cross the street in a wheelchair, and saying they have a lot in common because they both have a set of wheels. I think mental health professionals and others who believe narcissism and Aspergers are on the same spectrum need to dig a lot deeper before they make such sweeping generalizations. They are not the same disorder at all and are certainly not on the same spectrum. Aspergers/high functioning autism is a neurodevelopmental deficit and really a type of learning disability; narcissism is a moral deficit. 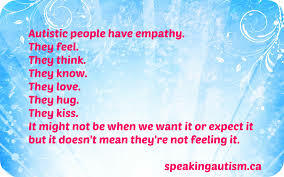 For further reading, please see my article, People with Autism Do Not Lack Empathy! Also see The Spectrums of Autism and Narcissism. This entry was posted in Aspergers syndrome, autism, autism spectrum disorders, narcissistic personality disorder, narcissistic spectrum disorders, spectrum disorders and tagged Aspergers syndrome, autism, autism spectrum disorders, boundary violations, differential diagnosis, high functioning autism, lack of empathy, narcissism, narcissistic personality disorder, narcissistic spectrum disorders, selfish behavior, spectrum disorders by luckyotter. Bookmark the permalink. Thanks for writing this — very informative and enlightening. This is a standard tactic of social predators – make your target look bad, and thereby make said target easier to secure. By making your target out to be ***evil***, it becomes ‘morally permissible’ to treat them worse than otherwise. Yes, I’m making a deliberate comparison with Goldhagen’s book here. He speaks of making ‘the eternal (mythical) jew’ intrinsically dangerous – which made the murderous portion of the Holocaust possible. Do I see India-style Lynchings happen to us – this country’s untouchables – its dalits? It’s possible. Same for Hadamar, Hartheim, and the other four places in Nazi Germany where they practiced on people like so as to practice for exterminating the other people who were wrong in some way. The first to be killed. Not the jews. People like us. For most, the Holocaust ended on the eighth of May. It continued for us for weeks after – often until some soldier stuck his wifle into the face of a murdering medico-magician.